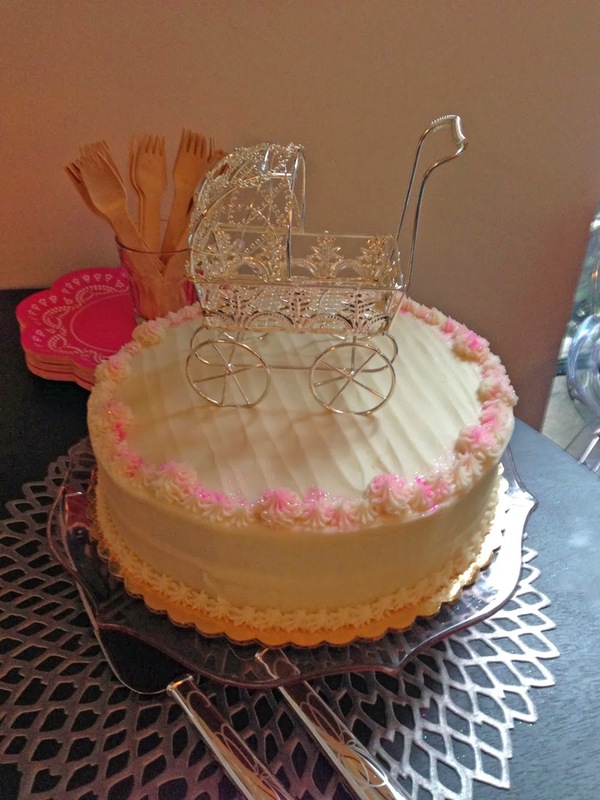 Though this was the first baby shower I've hosted, I knew that a shower was probably not the time to attempt complicated recipes. There is just too much going on with the gift opening, friends from different circles meeting, etc., to have to worry about being in the kitchen. For the shower, the mother-to-be requested pizza (her favorite), which was lucky for us hosts! As the guest count grew, we ruled out making homemade pizzas and decided to order in. Again, we didn't want to be distracted from the actual event especially when we ourselves didn't know all of the guests and wanted to spend some time getting to know everyone. 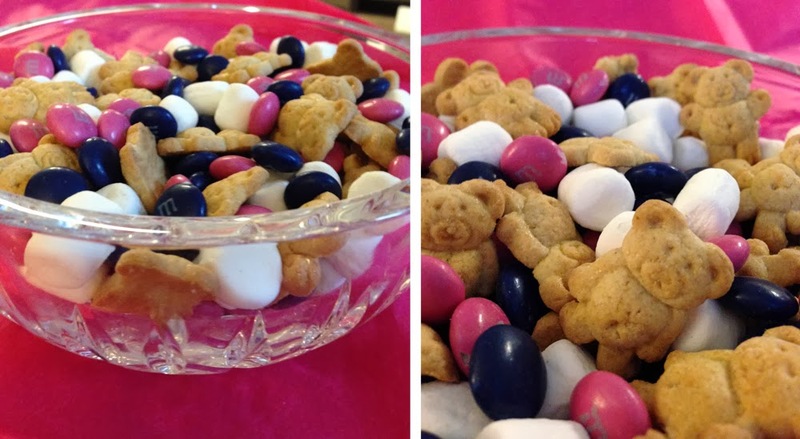 So before the party we prepared a cheese board with nuts and fruit, truffled tater tots (recipe from Spoonful of Flour), individual salads, and this Teddy Graham "S'mores" mix inspired by Ninah's Instagram account, which is my latest obsession. Seriously, could this be any cuter or more fun?! The graham cracker bears + chocolate + marshmallows = s'mores. (I'm spelling it out here because a few guests didn't make the connection!) 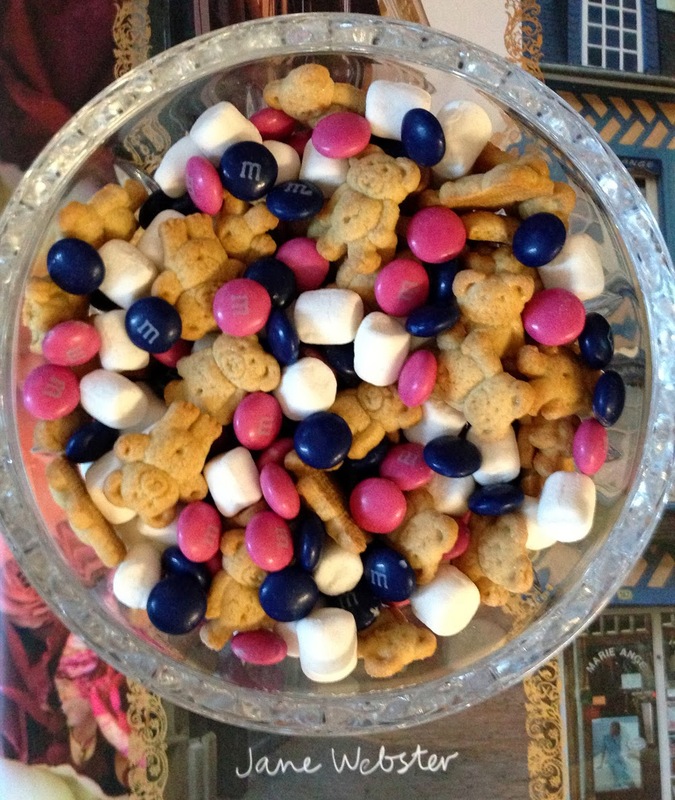 Luckily we have a candy shop in Dumbo called Dewey's Candy that sells M&M's by color. If you don't have a candy store close by, you can order online at Oh! Nuts. We placed a large crystal bowl of the mix on a side table on top of a stack of books, and a smaller one on the bar cart. It was definitely a hit with both the kids and the adults. Thanks Ninah for the idea! We ordered this vanilla cake with dulce de leche filling from One Girl Cookies. I've taken several classes at the bakery taught by their Executive Chef, Dave (and even got some entertaining tips from him, outlined in this post!) I'm such a huge fan of theirs. And I learned years ago that if I'm hosting a party, making the cake on top of everything else is just too stressful. As much as I love serving my own desserts, baking under pressure doesn't lead to great results. So it's great to have local bakeries to lean on for occasions like these. I moved the baby carriage made by Forever Sweet Favors from the bar cart to the top of the cake when presenting it. The paper plates in the background are part of the "Lovely Lace Collection" found on Shop Sweet Lulu. There are such pretty options out there for paper plates these days. The placemat is the "Dahlia" in gunmetal by Chilewich, and the cake server set is the "Belle Boulevard" by Kate Spade. Since this was a party for ladies we wanted to lighten up what seemed like heavy fare with these individual salads. 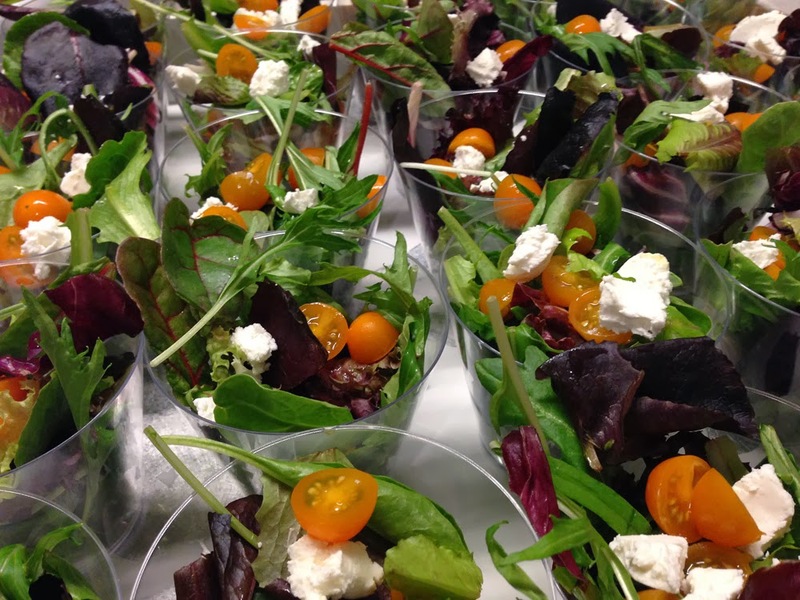 We used 25 plastic cups placed on a tray filled with mixed greens, crumbled goat cheese, and sliced yellow baby tomatoes. I made a simple pink grapefruit vinaigrette served in a cruet next to the salads. Yes. Kids and Adults loved the s'mores. Apologies my nieces ate all the m&m's!